This pic took FOREVER!!! Two of the dolls do NOT stand very well, and they kept falling and knocking the others down! In other news, I am slowly and steadily working on my middle daughter's birthday party, coming up in February. I have the cake topper, her present, and almost all of the party favors. Invitations were tricky, though. I usually make my own invitations, so that wasn't the problem. Most years, I choose some stickers that fit the theme and attach them to some scrapbooking paper to make a little postcard-type invite. The problem was finding stickers of Plum Pudding by herself. You can find Strawberry Shortcake everywhere, but not much with just Plum Pudding. After several unsuccessful attempts at finding Plum Pudding stickers, I happened to stop by Hasbro.com...and my problem was solved! Hasbro has a bunch of great printable coloring pages, and they had two different coloring pages with just Plum Pudding on them! I reduced the size, printed them out, and then the girls and I pulled out our trusty crayons and colored pencils and got to work! The backside of the invitation. This is where I'll write all of the party info. Invitation colored by my youngest. Invitation colored by my oldest. So Thursday, we had people come over who were affiliated with PG&E's "Care Program". The good news? They check your house for energy efficiency and replace any lighting or appliances that are not energy efficient (if our fridge had been two years older, we would have gotten a new fridge out of the deal). They ended up replacing almost all of our lighting with fluorescent lights and pretty new fixtures. Sounds great, right? And honestly, I really am grateful. Except for the fact that the new lighting has completely thrown off my photography skills in my doll room!! I've worked for a long time to figure out how to take pics in there just right. I don't like using flash because it's too harsh. Sometimes my pics were a little dark, but for the most part I had a system that worked. Okay, forgive my rant. I'm fine now. I just finished the "Goodbye Post" on Tess and Maggie's blog, and the pics weren't quite as bad as I thought they'd be. The lighting just looks weird to me. They may not look as bad on the blog, but they sure look crummy on the full screen. I'm definitely going to have to work on this. Okay, I just uploaded the above pic and it doesn't look nearly as bad as it did up close. Maybe there's hope yet. I'll just have to figure out something new for my headers and other big pics. This guy is not nearly as great of a doll. There are moments when he slightly resembles the Prince, especially in profile. Even then, though, they just didn't quite get his face right. He has enormous lips, a huge nose, a strange shape to his face, and his eyes don't seem like they're placed quite right (these pics actually make him look better than he does in real life...I guess I can be thankful that at least he's photogenic). He also has a hard time standing on his own, as if he's overbalanced or something. And he's not nearly as tall as I thought he'd be. Probably the worst disappointment is his Beast costume. His Beast head is proportioned way too small for his body. Even worse, the Beast's neck doesn't even touch the shoulders of the doll, so there's a gap between his shoulders and neck. As for his paws, they are attached to the sleeves of the blue jacket, which is typical for these dolls. What's not typical is having to twist the sleeves of the jacket around so that the Beast's "thumbs" are in the right place. The thumbs were pointing down when I first put it on, and it didn't look right. I also have the older version of the Disney Store Beast/Prince doll, so I took some pics next to my new one just to compare them. This version has a much better Beast head design. Unfortunately, that part is in storage somewhere. If I can find it later, I'll add some pics to this post. So here are the guys. You'll notice that while my new Prince has a fairly narrow head, the old Prince doll's is even smaller. I think they did a better job with the new Prince's eyes, but the old Prince is better looking overall (despite his somewhat cheesy grin). I think a big problem is the new Prince's nose: it just looks humongous! WARNING: UNDIES PICS COMING UP!!! So here we have the Princes in their skivvies. You'll notice that the Disney Store has changed the Prince doll body style dramatically in the past few years. The older doll is just about fully poseable. He has elbow, knee and wrist joints, and his head and waist move up and down as well as side to side. It's too bad they changed this, because it would have been fun to have a fully poseable Prince doll to match the new poseable Princess dolls. The newer Prince does have jointed elbows, but other than that resembles a Ken doll in poseability. You'll also notice that the older Prince is much more built than the newer one. I'm not sure what prompted this change either...maybe giving little girls more realistic expectations and little boys better self-esteem? :} Another reason could be that all those joints wear out quicker than a few simple joints. My daughters have the old version of Prince Phillip, and it's getting hard for him to hold any pose because his joints are so worn out. The above pics show the differences in the two Prince's arms. One annoying thing about the old Prince is they used two different shades of plastic to make all of his parts. What's up with that? Leg details. The new Prince looks like he hasn't worked out his legs quite as much as the old Prince. Notice the difference in their feet. I much prefer the older mold for its detail. Here's a profile shot from the movie for comparison. 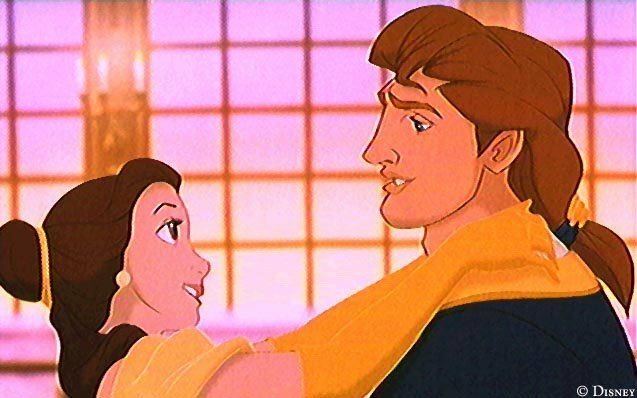 In all fairness to whoever sculpts the Disney dolls, this would not be the easiest profile to recreate. It's actually pretty close. Huh...he kinda has big lips in the movie, too. Here are the two sets of clothes. The newer Prince's outfit is all one piece. I think it is slightly better quality. The pants are fully lined with a mesh or veil-type material, and the gold trim on the sides of his pants looks nicer. The blue "jewel" on his cravat is pretty pathetic, though. The older Prince's outfit consists of three pieces. He has a nicer vest, but no cravat. Their boots are exactly the same. I started by taking two small sections of hair and separating them from the rest. I didn't take them from right at the front of her head. I left some hair in the front, as you can kind of see from the next pic. After I separated the hair, I started a tiny braid. I continued braiding until I had braided almost to the end of her hair. Then I did the same thing on the other side. Now I had two tiny braids on each side. After the tiny braids were finished, I braided the leftover hair in the center. I included the hair I'd left in front of the tiny braids and used it in the big braid in the back. Next I took the two small braids and criss-crossed them around the big braid in back. I repeated this all the way down the braid. I used my one clear rubber hair band to hold the ends of the two small braids in place underneath. And here's the finished product! I was quite pleased with how it turned out. The next day, I tried another variation. I kept the tiny braids in, but started the big braid in back with a twist on both sides of her head. Then I braided the rest the same as before. Last Chance to Enter the Innerstar U Giveaway!